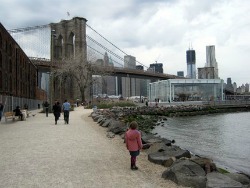 Brooklyn's Dumbo is one of NYC's funkiest neighborhoods but it's not just for hipsters; there's plenty for families to enjoy. This former industrial area is now a culture, arts and shopping hub filled with charming children's boutiques, tasty spots like Dewey's Candy Store and Brooklyn Ice Cream Factory, and Brooklyn Bridge Park, which features incredible views of lower Manhattan, Jane's Carousel, wonderful playgrounds at Pier 1 and Pier 6, and lots of kid-friendly activities and festivals. The neighborhood also hosts the annual weekend-long Dumbo Arts Festival, which includes lots of opportunities for families to explore and create super-cool art.